I like baking with buttermilk for the richness it adds without extra fat. Despite the name, there is no butter in it. Buttermilk used to be the liquid remaining after cream is churned into butter. Now it is nonfat or lowfat pasteurized milk with added lactic acid bacteria, the same healthful bacteria as in yogurt. Buttermilk makes a soft moist crumb in cakes and pancakes, plus gives a little tang. Rita used buttermilk in her Cornbread with Cranberries and shared tips on buttermilk replacements such as adding cream of tartar to the flour, or vinegar to milk. The cream of tartar option was new to me, so I tried it out. It’s a good substitute in a pinch, and a nice use for rarely used cream of tartar, though I still prefer buttermilk for the finer crumb and best leavening. So now you have two recipes from GetCookingSimply to use up your carton of buttermilk! PREHEAT oven to 350 F. Coat a 9×9-inch baking pan (glass or metal) with cooking spray. 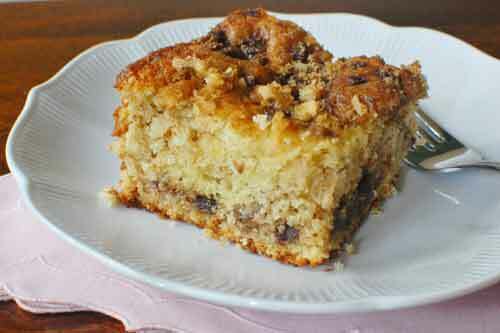 COMBINE dates, brown sugar, walnuts, 1/2 teaspoon cinnamon, and nutmeg in a small bowl. Set aside. COMBINE flour, 1 teaspoon cinnamon, baking soda and salt in a separate bowl. Set aside. BEAT sugar and butter in a large bowl with electric mixer until fluffy. Add eggs and beat until light and creamy, about 3 minutes. ADD flour mixture alternately with buttermilk, mixing on low speed just until batter is just blended. SPREAD one half of the batter in prepared pan. Top with one half of the date mixture. Spread remaining batter over dates and sprinkle remaining date mixture on top. Bake immediately or cover and refrigerate overnight. BAKE for 40 to 45 minutes or until deep golden brown and pick inserted in center comes out clean. (If refrigerated, bake uncovered 45 to 55 minutes.) Cool 15 minutes. Serve warm or room temperature. Makes 9-12 servings. *To chop whole pitted dates, wet a sharp knife with water and re-wet as needed to prevent dates from sticking. **Buttermilk substitute: add 2-1/4 teaspoons cream of tartar to flour mixture and use 1 cup lowfat or whole milk OR add 1 tablespoon vinegar or lemon juice to 1 cup milk and let stand a few minutes to curdle. Note that recipes with buttermilk almost always have some baking soda which neutralizes some of the acid in buttermilk and adds to the leavening. 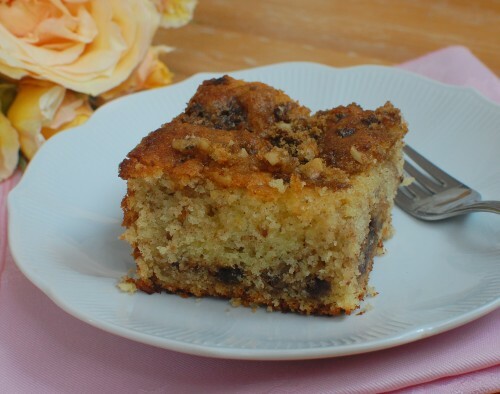 Recipe originally developed by Rosemary Mark for Sun-Maid Dates. Always looks delicious ladies! Thanks for your yummy (and timely) ideas! Hey, thank you Laura! We like doing the posts and love having comments 🙂 Did you know about adding cream of tartar to replace buttermilk? Just curious if it’s new to others too. Love overnight option; I am going to try the recipe with fresh blueberries. Let me know how you it turns out Peggy. And I hope you get to share it with her!